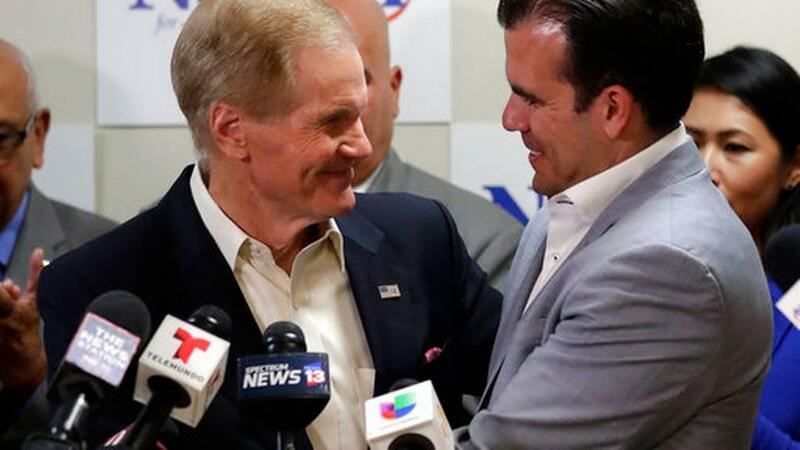 U.S. Sen. Bill Nelson, left, is embraced after Puerto Rico Governor Ricardo Rossello, right, endorsed his bid for the senate in front of supporters and media during a news conference Monday Oct. 1, 2018, in Orlando, Fla.
During a press conference with Nelson in Orlando, Rosselló, a Democrat, called the decision to back Nelson a “tough” one. Scott has “also been a friend,” Rosselló acknowledged. “But I am here, in spite of that, because I believe in Bill Nelson. I am grateful for his long-standing relationship for the people of Puerto Rico,” he said. Rosselló and other Puerto Rican leaders have sharply criticized President Donald Trump, who has close ties to Scott, for the administration’s response to the storm, which wiped out electricity island-wide and resulted in 3,000 deaths, according to George Washington University researchers. Trump has also been disparaged for accusing Democrats of inflating the number of fatalities. Nelson was instrumental in nailing down federal aid following Maria, Rosselló said. Rosselló also praised Nelson for “fighting for general equality for the people of Puerto Rico and having us finally have a chance to have first-class citizenship as citizens of the state of the union,” a move the governor has championed as he throws his support behind candidates on the November ballot. The three-term Democratic senator returned the gratitude expressed by Rosselló. “I am profoundly grateful, governor, that under difficult circumstances you would want to speak out and be clear on your preference,” Nelson said. In Scott’s numerous visits to the island following Maria, he frequently has appeared side-by-side with Rosselló. As recently as 10 days ago, the two governors attended a ceremony marking the one-year anniversary of the deaths and destruction caused by the massive storm. But Scott’s campaign pushed back against the endorsement even before the Democrats’ Monday morning news conference, releasing a Spanish-language ad starring three Latinos who said they are Democrats but are voting for Scott. Shortly after Nelson’s announcement, Scott’s team issued a news release with the names of dozens of Puerto Rican leaders who are backing the Republican in his attempt to unseat Nelson. “To our fellow Puerto Ricans in the State of Florida: Governor Rick Scott has always been there for the people of Puerto Rico when we need him. Without excuses, with a GENUINE disposition to help and protect Boricuas, he was there for us after Hurricane Maria struck the island,” Puerto Rico Senate President Thomas Rivera Schatz said in the release. In the competition for Boricua endorsements, Nelson has also snagged the support of Rosselló’s father, former governor Pedro Rosselló, as well as the younger Rosselló’s predecessor, Alejandro García Padilla. The mayors of Puerto Rico’s two largest cities, San Juan and Ponce, are also backing the Democrat. Rosselló on Monday also threw his support behind Democratic gubernatorial candidate Andrew Gillum, who is facing Ron DeSantis, whose Trump endorsement helped the former congressman cruise to victory in the Republican primary in August. For Nelson, the support of Rosselló “is big for those people who believe in statehood” for Puerto Rico, according to Marcos Vilar, executive director of Alianza for Progress, a progressive organization focused on Puerto Ricans in Central Florida, where the highest concentration of Boricuas live. Scott also supports Puerto Rican statehood, but Trump recently said he does not. Because he is linked so closely with Scott, the president’s position may have tipped Rosselló --- who’d been criticized for staying on the sidelines in the Senate race --- toward Nelson, Vilar said. The issue of “status,” shorthand for statehood, is a big divider for Puerto Ricans, he said. The political committee affiliated with Alianza has endorsed Gillum but hasn’t taken a position on the U.S. Senate race, Vilar said. The Sunshine State is home to more than 1 million Puerto Ricans. They are considered a critical November-election voting bloc in Florida, where nail-bitingly close elections have become the norm. 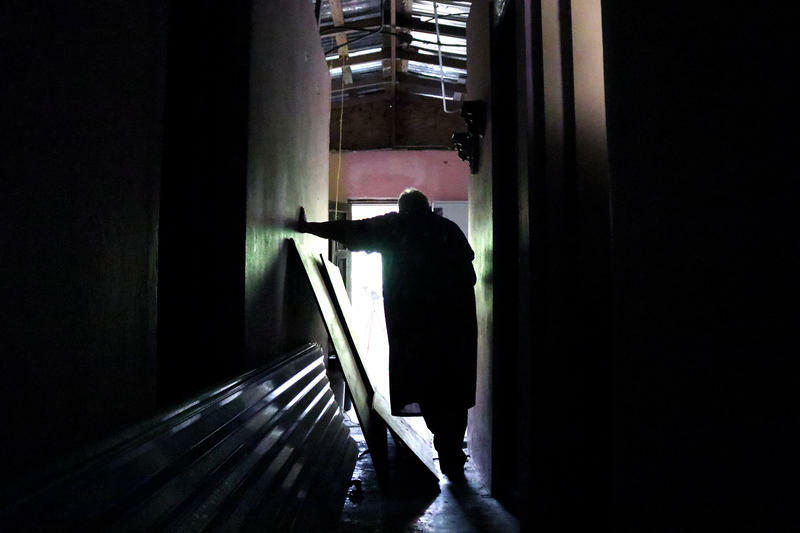 According to the University of Florida’s Bureau of Business and Economic Research, between 30,000 and 50,000 Puerto Ricans relocated to the Florida after Maria. While that projection is far lower than originally anticipated, a growing number of Puerto Ricans have migrated to Florida over the past decade, BEBR found. Puerto Ricans make up about 21 percent of Florida’s 2.3 million Hispanic voters. With population growth and post-Maria migration, the number of Puerto Rican voters in Florida could be between 460,000 and 580,000, according to Matt Isbell, a data consultant who works for Democrats. More important than endorsements, Vilar said, is the work groups like his are doing to register Hispanics and make sure they get to the polls in November. 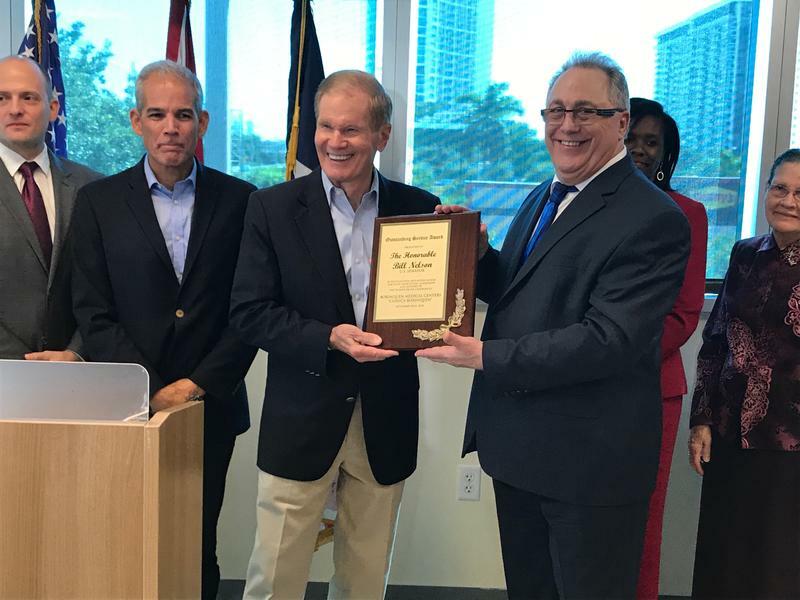 Groups such as the Hispanic Federation and Mi Familia Vota this year registered more than 75,000 new Hispanic voters in Florida, and up to 60 percent of those are Puerto Rican voters, Vilar said.